Ah.. What can we say about this gem? An Hydra wedding always seize to amaze us. Like Jenny and Tasso’s three-day long celebrations in this traffic –free island. Hydra is the island where you can get anywhere on foot or a donkey! The most picturesque island in the Saronic Gulf and just 2 hours away from the busy capital, Athens. 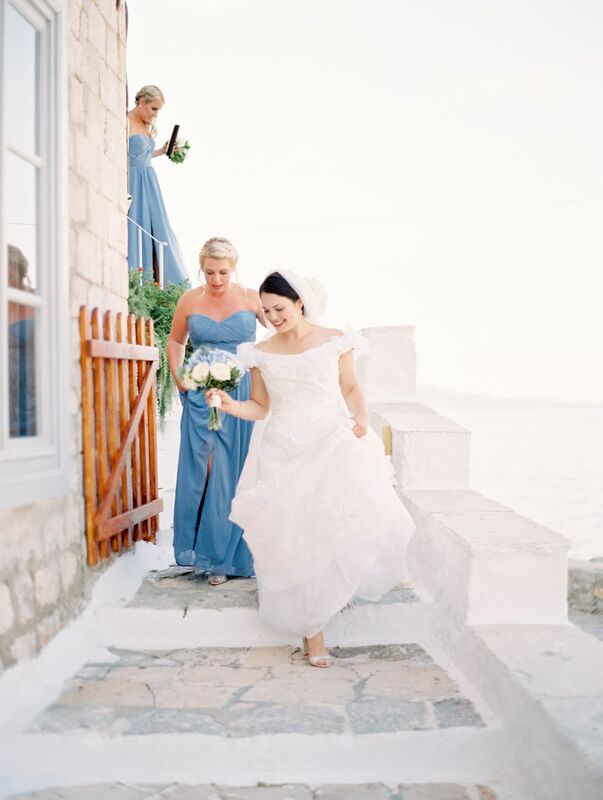 What better background ask for when creating impeccable imagery than traditional stone mansions, narrow cobblestoned streets and that crisp Aegean blue? 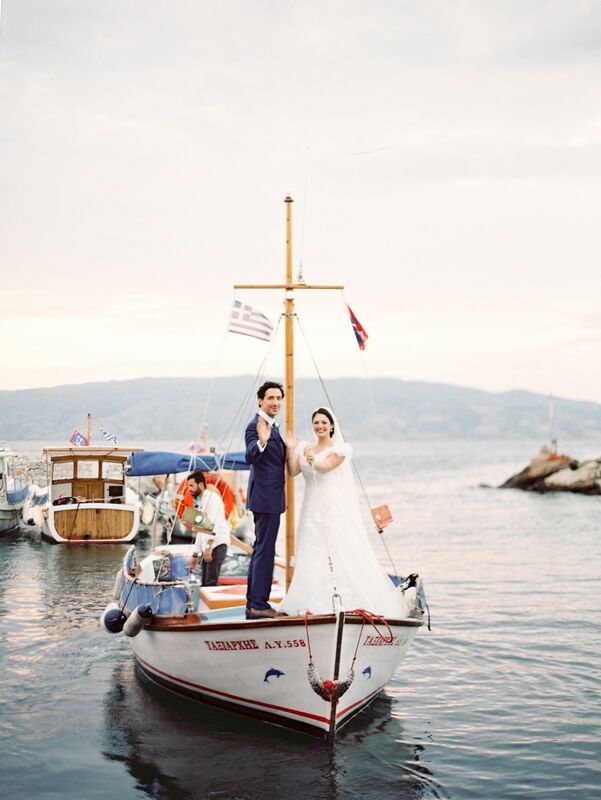 Jenny and Tassos fell for this island and they knew instantly where they would like to celebrate the beginning of their life as a couple. Flying from the US with their families and friends, they planned a wedding weekend in all its glory. With the help of RT Events Group, Jenny’s vision came to life. Sunset yacht ride around the island and cold drinks led to amazing moments filled with lots of love and laughter. We cannot put in words what an amazing crew this was and the coolest vibe you would get from this couple. We do hope that our pictures can communicate this to you though! Having an island wedding, would not be complete if blue was not one of its colours. And what a harmonious décor this one was, all dressed in bright white with hues of blue. Something borrowed; something blue was definitely a sensation in this wedding! Following an intimate ceremony where different customs of both the groom and bride’s background were incorporated, was a lively party like no other at magnificent Castello. Capturing those happy looks on film, the vivid dance moves and the love in the air all over is why we do what we do. Jenny and Tassos also decided to devote some time to enjoy the moment in the company of each other so, we had arranged for an extra day of photo shooting in this romantic location. Fuchsia bougainvillea, whitewashed walls and glorious sunlight made up for the most romantic scenery to get lost in the arms of each other. We had the opportunity to create imagery for these two that really allowed us to tell their story through our lens. Always make time for each other before the big day arrives, walk around your favourite places and share a kiss, a laugh, a hug. This will make all the difference when you look through your wedding photographs and reminisce. So, let us take you to Hydra island and catch a glimpse of this amazing love story with the most romantic and heartfelt celebrations.